~Yahoo News UK. Thursday, May 10, 2018. 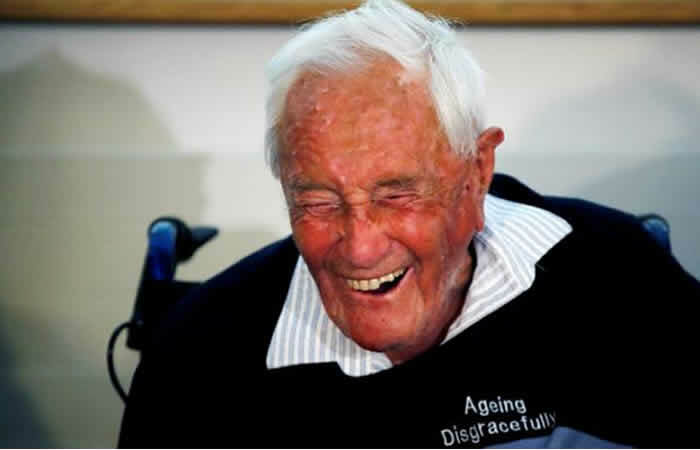 British-born academic Dr David Goodall has explained why he has chosen to end his own life at the age of 104. Dr. Goodall, who was born in Britain but lived for much of his life in Australia, travelled to Switzerland to visit a euthanasia clinic. Wearing a sweatshirt with the slogan 'Ageing Disgracefully', he addressed a press conference today (Wednesday) on the eve of his death to explain his decision. “I am rather surprised at the wide internet in my case. I am very appreciative of the hospitality of the Swiss federation and the ability which one has here to come to an end gracefully,” he told reporters. “I am happy to have this chance, though I would have preferred to have had it in Australia, and I greatly regret that Australia is behind Switzerland in this move, and that most countries are in fact behind Switzerland. “One wants at my age, and even rather less than my age, one wants to be free to chose their death at an appropriate time. “My abilities have been declining over the past year or two - well, my eyesight has, for the past five or six years. He assured the gathered press that he had no regrets about the decision he had made. He also said that his family supported his decision and that none of them had tried to change his mind. “There are many things I would like to do, I suppose; but its too late. I am content,” he said. Dr. Goodall received a round of applause from those gathered after bursting into song during the press conference. When one reporter asked him if he had chosen a piece of music to listen to during his last moments, he replied that he had not, but that he would chose the final movement of Beethoven's ninth symphony. Dr. Goodall then sang a section of the piece of music to the delight of those present. Dr. Goodall will die on Thursday with a number of family members present.